The launch of the exhibition was celebrated with an Opening Event on Saturday, September 6th, 2014 at the Metropolitan Museum’s Grace Rainey Rogers Auditorium. The three-hour program, which sold out in less than 48 hours, was presented with the support of UNESCO, the United Nations Alliance of Civilizations, Cornell University Department of Music, and the Musical Olympus Foundation. Hosted by WNYC’s John Schaefer, the evening featured keynotes by Ken Moore, Frederick P. Rose Curator in Charge of the Department of Musical Instruments and Sheila R. Canby, Patti Cadby Birch Curator in Charge of the Department of Islamic Art. 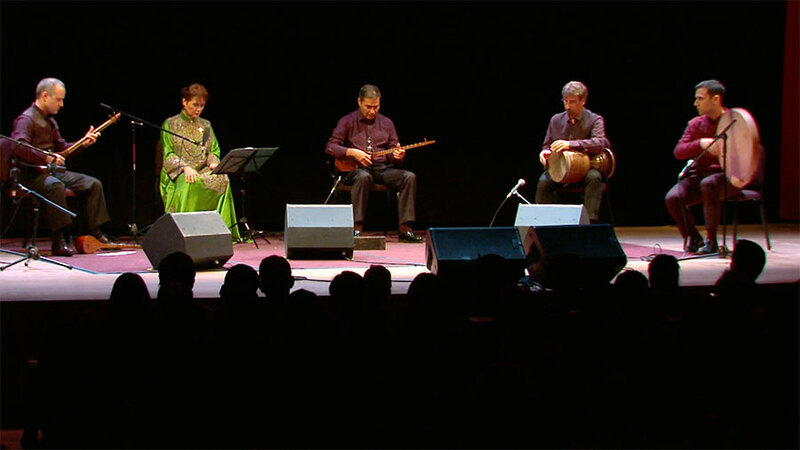 There were also a series of stirring musical performances that included a rare appearance by and interview with tanbur grandmaster Dr. Chahrokh Elahi, as well as performances by double bassist Renaud Garcia-Fons and lutenist Claire Antonini, who presented a fusion of eastern and western melodies inspired by Ostad Elahi’s repertoire. An engaging panel discussion examining the transformative music of Ostad Elahi brought together Clive Bell, musician, composer, and writer for the music monthly The Wire; Jean During, an ethnomusicologist specializing in Central Asia and a leading authority on the music of Ostad Elahi; and Robert Simms, an ethnomusicologist and multi-instrumentalist specializing in Middle Eastern and West African traditions. The evening concluded with a special keynote and poetry recital by Leili Anvar, Prof. of Persian language and literature, who highlighted the enduring and intimate relationship between music and mysticism through the works of Attar and Rumi. The recital was accompanied by a beautiful blend of sacred and contemporary music. 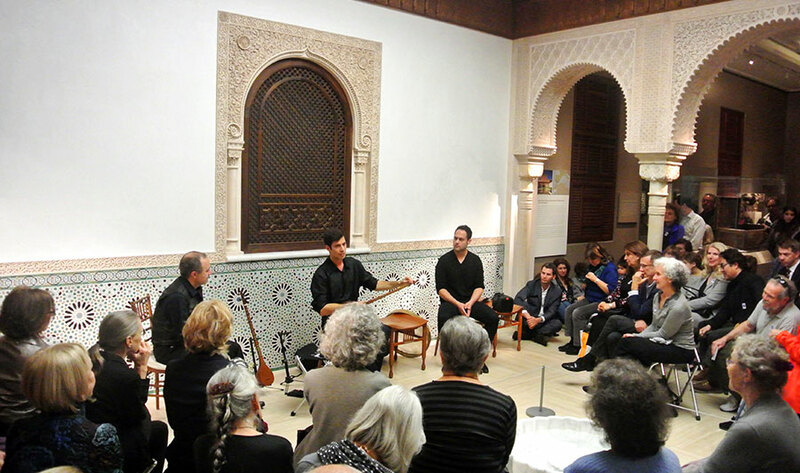 On Friday, October 10th, a special performance celebrating the Sacred Lute exhibition was held in the lovely Moroccan Court of the Department of Islamic Art as part of its monthly Moroccan Court Music Series. Dr. Sina Elahi, one of Ostad Elahi’s grandsons, discussed and performed several pieces from his grandfather’s repertoire on the tanbur, a testament to how this art form has been preserved and transmitted across several generations. He also demonstrated how Ostad’s musical contributions facilitated the compatibility of the tanbur with classical Persian music by performing several pieces accompanied by the setar and daf, or frame drum. On Saturday, November 15th, grandmaster Chahrokh Elahi conducted a rare tanbur masterclass at the Met for over 30 students in the Uris Center for Education Art Study Room. The two-hour workshop, which drew students from as far away as Europe and Canada, provided participants with a unique opportunity to learn about the spirit of the tanbur firsthand and how to effectively approach this complex art and its difficult techniques. Shortly after the conclusion of the tanbur masterclass, a special panel discussion convened before an over-capacity crowd in the Sacerdote Lecture Hall on the neurological and therapeutic impact of Ostad Elahi’s music. Moderated by Neuropsychiatrist and Multi-instrumentalist Emmanuel H. During, who was joined by Alex Doman, Founder and Chief Executive Officer of Advanced Brain Technologies; Jay Lombard, Chief Scientific Officer and Medical Director of Genomind; and Concetta Tomaino, Executive Director and Co-Founder of the Institute for Music and Neurologic Function, the panel explored how to better identify and understand the various elements in Ostad Elahi’s music that contribute to its creativity and impact. On November 16th, a special Sunday at the Met program presented in conjunction with the Sacred Lute exhibition took place at the Grace Rainey Rogers Auditorium. 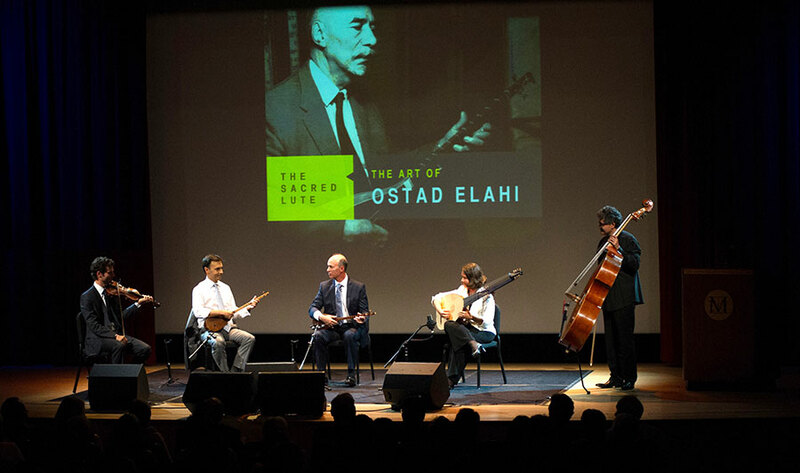 Hosted by Ken Moore, Curator in Charge of the Department of Musical Instruments, the program traced the spiritual and musical journey of Ostad Elahi through the art of his tanbur. The standing-room only event began with a lecture by Prof. Jean During, a renowned ethnomusicologist and foremost expert on Ostad Elahi’s music, entitled “In Pursuit of Perfection: The Music and Life of Ostad Elahi.” Subsequently, a pair of culturally distinct performances by the Garcia-Fons Quartet and the Parissa Ensemble highlighted the range of musicians and musical genres that have been deeply influenced by Ostad Elahi’s repertoire and his conception of music. 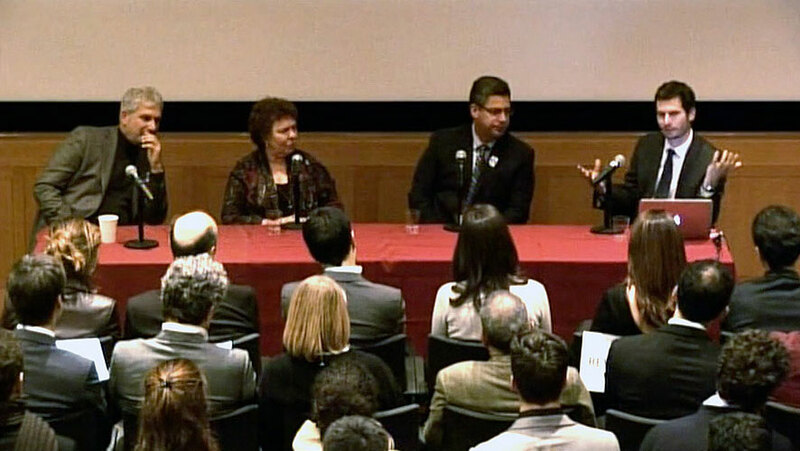 The entire video of the program is available on the Met’s website. 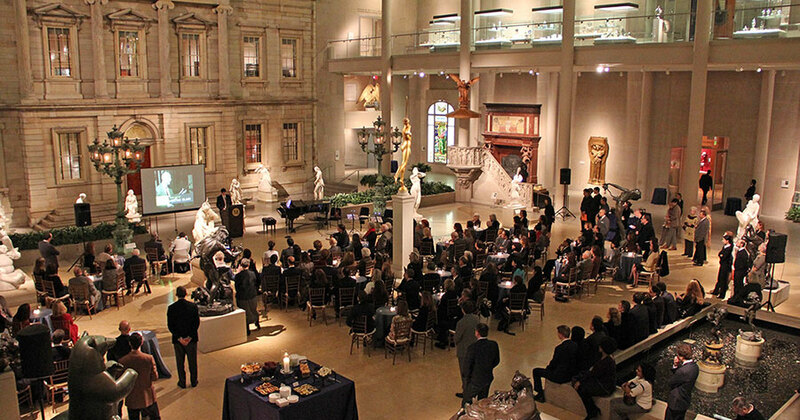 On Thursday, January 8, 2015, a closing reception in the elegant American Wing of the museum provided the perfect forum to fondly look back upon the past five months and to revisit many of the memorable highlights from the exhibition and its supplementary programs through the presentation of several short film clips. A musical performance by the classically trained members of the Italian Ensemble Laudanova featured beautiful compositions on the piano, violin, flute, and guitar inspired by Ostad Elahi’s music.